It’s not often that I can claim to have personally met every person quoted in an article appearing in The New York Times. Actually, it’s never happened before last week. “Valley Skiing Far From the Bustling Crowd” written by the golf columnist Bill Pennington pays homage to the isolation and authenticity of the Mad River Valley, which is located in north-central Vermont in the middle of the Green Mountains. I know the Valley intimately since my father (who died in 2010) and my stepmother moved there in 1979. For the past 36 years I’ve spent some part of almost every winter and summer there. My children have grown up skiing its mountains and swimming in the river. 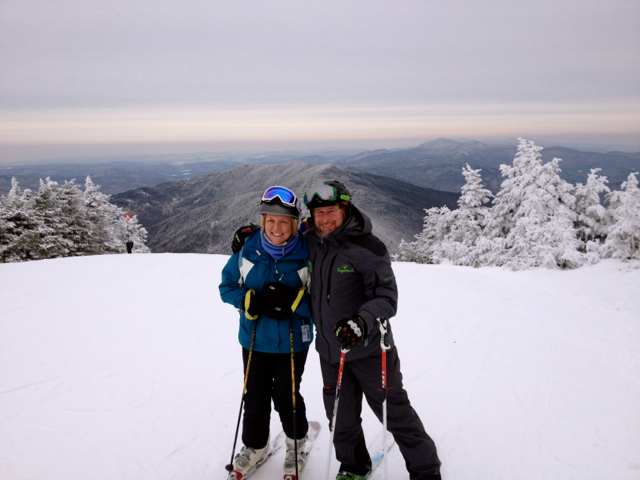 Here I am skiing at Mount Ellen with John Egan, who was quoted in a The New York Times article about the Mad River Valley. No traffic. No billboards. No neon lights. No chain stores or restaurants. It’s a place to breathe, to count silos or pine trees or cows or stars. And on a clear day you can see the Adirondacks and the White Mountains from the top of any of the Valley’s three ski peaks. I completely agree with Pennington’s excellent point that the Mad River Valley’s remoteness is part of its charm as a ski destination. Although my family could be at one of the southern Vermont ski resorts in 5 or 6 hours we willingly – and regularly – spend over 8 hours in the car to get there from Delaware. But there are some other things that are special about it that didn’t make it into his article. And since I’m always happy to play ambassador for this small slice of Vermont heaven, I thought I’d just publish my own addendum to his piece that widens the lens a bit. 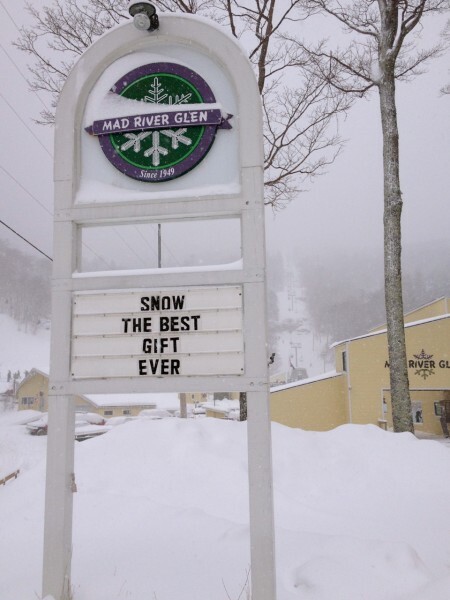 Mad River Glen is my family’s home ski mountain. What are some special things you can do in the Mad River Valley? You can rent a room in a country inn or ski lodge. What’s really special and old school and even kind of European about lodging in the Mad River Valley is the chance to stay in a small place where you sleep under a quilt and the owners cook your eggs in the morning. Pennington mentions this possibility in the body of his article, but his lodging suggestions listed in the If You Go section include only one example of this genre among the myriad options that are available. I’d like to point you to a few additional choices. Millbrook Inn – Full disclosure on this one: it belongs to my stepmother Joan. (So if you’ve ever had a burning desire to find out what I was like as a teenager make a pilgrimage and I’m sure she’d be happy to share.) But all family loyalty aside, the Millbrook is the real deal when it comes to country inns. The original building dates from the 1850s, the wide floorboards are satisfyingly creaky, and the walls are decorated with stencils. There are plenty of places to curl up with a good book or play a game next to a crackling fire. And you cannot beat her made-to-order breakfasts – pretty much everything I know about pancakes and bacon comes from them. Joan will also make your family dinner if you arrange in advance – and trust me, you want her to. She’s a wonderful cook with the global sensibilities that come from her wide-ranging travels – she’s visited and eaten her way around the world for decades. This inn is pet-friendly, though you should let her know if you’re bringing your dog, and is best suited for families with kids who are 10 and older. Mad River Barn – The Barn is a local landmark that started life as a bunkhouse for Civilian Conservation Corps workers in the 1930s before it became a place for skiers from the newly opened Mad River Glen in the late 1940s. An iconic, wood-paneled destination for ski bums and families alike to stay during my childhood, it had fallen into some disrepair but has been completely renovated to be both chic and cozy. The bar area retains its ski-lodge feel with its large stone fireplace and animal heads on the walls; it is also full of fun for kids including foosball, air hockey, and tabletop shuffleboard. There’s a full dinner menu served in both the downstairs dining room and in the bar area; I recently had some local short ribs there that were to die for. If you’ve got young kids or a bigger group, the Barn has a variety of room configurations including a separate farmhouse building, family-friendly suites, and rooms that sleep up to six people. Waitsfield Inn – Housed in another of the Valley’s 19th-century buildings, this inn has the virtue of being right in downtown Waitsfield and an easy walk to shops and restaurants. Families who stay here have several options for sharing a room including one that has a four-poster queen and two twin beds. This list is just a sampling of some of the inns in the Mad River Valley – check out the Chamber of Commerce website for a more complete listing. 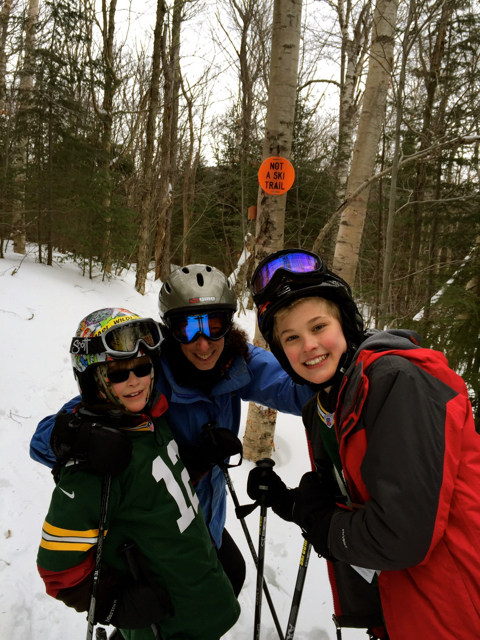 The family that skis together stays together – my stepmother hits the slopes with the boys when she’s not busy running the Millbrook Inn. Staying at a small inn is a special experience that’s quite different from a hotel. Much as I love the internet for travel planning, when you book at an inn I recommend picking up the phone. Not only will you get a feel for what your stay might be like – often from the person who owns the place – but you can find out if the inn is the best place to accommodate you and your kids. Some inns are better for children than others. You can shop at a local, family-owned grocery store. Perhaps you’ve decided that you prefer to rent a condo in the Mad River Valley instead of staying in an inn. I’ve got great news for you: The Valley is home to a wonderful family-owned supermarket. Mehuron’s may not look fancy or especially large but start to poke around and you’ll quickly realize that they have everything you could possibly want. They sell a wide-range of Vermont-made products including local meat, Red Hen bread (which is delivered daily), and a selection of beers from around the state. What I really love about Mehuron’s is how democratic it is – want fancy French pâté and champagne? You’re covered. How about frozen pizza and Gatorade? They’ve got that too. You can eat more than one kind of pizza. I’m a huge fan of justifiably famous American Flatbread. Love it. But in the winter in particular it can be hard to get near the place (as Pennington himself points out the wait is often hours long and they don’t take reservations). Happily there are other places where you can get a pie. Local favorite The Blue Stone, which also has a location in nearby Waterbury, recently opened in Waitsfield, right in the heart of the Valley. You’ll find pizzas topped with things like Vermont goat cheese, a balsamic reduction, and roasted chicken or cherry peppers, smoked ham, and a fried local egg. Looking for more traditional red sauce Italian joint? Check out Bongiorno’s on Route 17, which is just a few doors up from the Millbrook Inn. This kid often eats ice cream for lunch at The Sweet Spot. You can enjoy the best ice cream in the world. OK, so this accolade is according to my children and not any true food authority. But they have eaten ice cream in both Italy and France, to say nothing of numerous locations around the United States so they do have a basis for comparison. The Sweet Spot is a tiny bakery selling delicious sandwiches and cookies – we’re fans of the grilled eggplant panini and the house- made Oreo-style cookies. 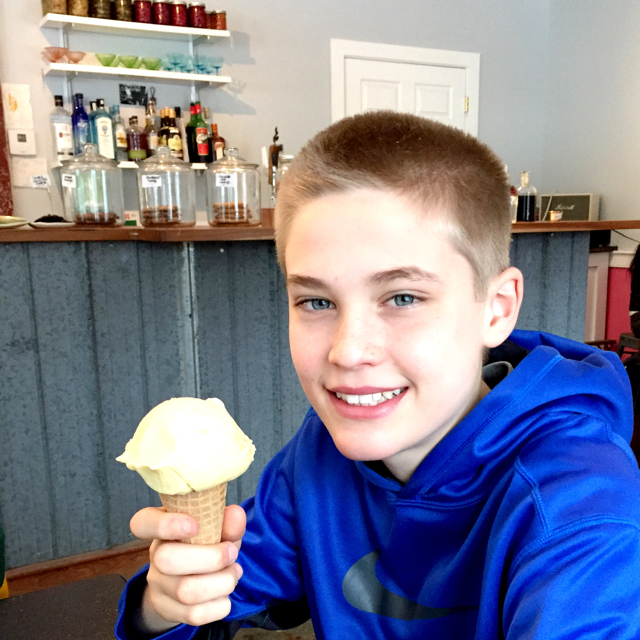 But more often than not my older son on our visits there Tommy passes on the baked treats and orders a cone of Scout’s Honor ice cream. We’ve never had a bad flavor, but the maple is exceptional. 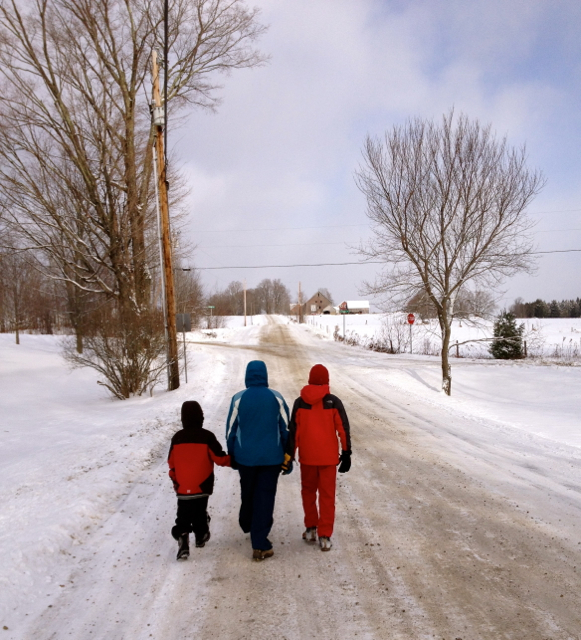 The Common Road in Waitsfield is one of my family’s favorite places to go for a walk. I guess I understand why Bill Pennington may have left a few things out of his article – I’m sure I’m going to be guilty of the same thing here. But whatever I’ve neglected, I hope I’ve given you plenty of reasons why the Mad River Valley is worth following the winding road to find. very detailed, I would say a compliment to what’s written in “Valley Skiing Far From the Bustling Crowd” .